We went to the Library last week, and Littletree was surprisingly uninterested in looking at picture books, or reading stories. I felt a little taken aback. So we decided to leave, bookless. But on the way out, I saw a cool looking book in the Adult Non-Fiction area, though it was clearly a non-fiction book for kids. Its called The Incredible Journey Through The Human Body and Littletree was instantly addicted! 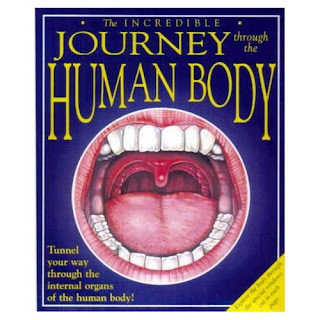 Its a really cool book, which basically describes how the body works, described in a way that feels like you are a tiny being travelling through the body's systems. There are holes in the page, so you can see through to the next part, and great illustrations. Basically, it starts at the mouth, and travels the length of the digestive system, at the end of which we end up escaping the fate of the other food and slipping through the intestinal wall into the blood stream, and then follow that through various organs, till we get to the lungs, learn about respiratory system, and up to the brain and nervous system, escaping out of the eye. So now Littletree is constantly talking about how her body works, she is really aware of the different processes that make up her being. Before she knew that food gives her body energy to grow, but now she knows that food is broken down by chewing, digested in the stomach and the nutrients are absorbed through vili in the intestine, while waste is mixed back in and it all turns to poop. She is really interested in how the taste buds work, and how different parts of the tongue taste different flavours; after we read that page, she ran to the fridge to start tasting different things on different parts of her tongue. Well, my computer is anyway, which is directly transferrable, since my computer is my life. Or at least, a pretty big part of it. In the interests of trying to make my computer work again, I'm finding out about registry fixers, anti-virus stuff, spyware, adware, underware, disc cleaners, junk files... lately I'm becoming very familliar with the Blue Screen of Death, which is popping up with ever-increasing frequency. I didn't know what it was, other than something gravely wrong with my computer. The first time it popped up, it flashed away before i could really see what it said, but the second time, I was quick enough to take a photo. I emailled it to Purple, who explained about bluescreen... Apparently, it is famous for popping up when Bill Gates was giving a demonstration of a new version of Windows. Meanwhile, my computer is still struggling, its getting slower and slower every day :( It keeps crashing, it wont play discs, it gets even slower. My good buddy Bluescreen pops up again. Today I got another error message. Its frustrating. I've been doing all these diagnostic and repair things, mostly guided by Purple online - he showed me this amazingly cool add-on in Skype called Unyte, we both signed on to it, set the right settings and BANG! Purple had control of my computer from afar. I just sat back and watched while the mouse ran around the screen and words were magically typed. It was very cool, and I highly recommend trying it, if only for the novelty value. My solution? I think I'm just gonna buy myself a new computer, and retire this one in Littletree's direction (actually, its pretty much hers already). SO! I am hereby opening the official Donate to Buy Me a New Computer Fund, just think of how it will further Littletree's education, having her own computer! why, she will very quickly have to learn all this marvellous stuff about Kernels and Bluescreens and whatnot. All donations can be made with just a few clicks of your mouse; if you can drag your eyes away from my scintillating prose for just a second, gaze at the upper right of the page: there is a PayPal donate button... If you've never used PayPal before, its time you learned - think of it as an educational experience! Big sheets of coloured card, sketch pads, paint brushes, new markers, sparkles... and more food dye. Of course the second we got home, the sparkles were immediately spread throughout the house :-/ at least they're green. This morning, she woke up early demanding that we go next door to invite Ana over to do colouring. I helped the girls get set up with glasses and jars filled with water, medicine droppers, the food dye, paint brushes, paper, bottles... they spent ages excitedly mixing drops of colour to make a variety of shades. It was really great, and we talked about how different colours can mix to make other colours. Littletree finally understood why I had put my foot down in the store and only bought 3 colours; red, yellow and blue, rather than the full range of colours she had wanted. Of course I tried to explain it to her in the shop, but she didn't get it till we actually did it. Then they were using the paintbrushes to paint with the different colours, and got into making pictures. Ana went outside and picked some white flowers and brought them in to dye different colours, then she glued the petals onto her painting. It was great! In the end, they ran over to show Ana's mum the bottle of pink water she'd made, and I was left to clean up the mess... I did keep all the colours that weren't so mixed they became black, they look fantastic arranged on the window sill. My only problem now is that we dont have any more drinking glasses! My latest article was published on Essence of Life, its called Parenting a Rainbow Child. I'm not super happy about how my editor edited this time, but I suppose it was a bit long and she needed to cut something. and I've been asked to write a series of articles for teens. So far its a bit of a challenge, but I'm really enjoying looking around at teen stuff. Our toilet is a composting toilet, its in a little open-air shed about 50 metres from our back door. Of course, being in the bush, and having grown up in Australia with the endless urban myths about Redbacks under the toilet seat, I make it a habit to lift up the seat to check before use. Funnily enough, I recognise this as a slightly foolish paranoia; the chances of there being a spider there are so slim, and the chances of getting bitten even less, and the chances of it being dangerous are tiny. So I laugh at myself and keep checking. But last night, Littletree suddenly needed to 'go'. It was pretty late at night, but she was in a hurry. Somehow, I didn't check under the seat before she sat down. No problem. She did her thing and jumped off. THEN I lifted the seat so we could sprinkle some ashes and sawdust in there (its a very basic composting toilet), and what was clinging to the underside of the seat? not just any old spider, not even a biggie like the one in my towel. This one was a GIANT. Seriously, no exageration, this thing was the size of my outstretched hand!!! I'm not joking, its body was almost as big as my palm, and its legs spanned the size of my finger breadth! It looked like the same species as my towel spider, or at least similar, but heck, this one must be the great great grandmother of them all! I've never seen a spider like that outside of South America. it was massive. With such a huge, fat, hairy body. The thing clung to the underside of the toilet seat for a bit, and then crawled all over the seat and scurried into a crack in the wall. So, I've been a little bit slack lately, but it's not my fault! Purple sent me a copy of the new Harry Potter book, and I've been a little bit lost in it. I'm now starting to suspect that its not the "real" book, but a fanfiction, anyway, I dont really care, as I'm having fun reading it, and if it is, then I'll get to read another one when we buy the JKR version. For me the only sad part is that Littletree is still too young to appreciate Harry Potter. Though I can look forward to reading them with her in another couple of years. Though I've managed to keep us both more-or-less fed, I did neglect to cut firewood the other day, meaning that we spent one frigid night without a fire. OOPS! Meanwhile I've been watching eBay Barbie lots like a madwoman! What's REALLY got Littletree's attention, is Bridges. she's building them everywhere. So I finally made good on my threats to help her build a big bridge that we can walk on. It was pretty simple, I just used some logs that we had collected for firewood and were awaiting being chopped up. We picked a nice spot next to the house, and laid the logs in. I wedged little rocks around them so they would be stable. For the planks, there was some bamboo cut-offs lying around from the old ladder to our bedroom loft, so we cut them to size with the Swiss army knife, and split them with the machete. (yes, I let my 4 year old daughter use a machete). I tied all the bamboo planks down with string, by that time, Littletree was getting a bit bored, and decided her name is Tainer-Magic, and used a magic rock to turn herself into a mermaid so she could swim under the bridge. Meanwhile, it turns out Littletree actually wanted to have a Barbie with Pink hair, so... getting creative, I bought some Pink food colouring (Thanks to A+A for the inspiration). In the store I was looking at the food colourings, musing to myself if it would work, and there was a woman standing behind me looking at the pasta section, and she heard me talking to myself and said that her granddaughter had coloured her hair with food dyes, and it worked fine, and didnt rub off on all the clothes and blankets; it just wore off in the shower. So, this morning, we dyed Barbie's hair. I took a medicine dropper, and showed Littletree how to drip the colour into her hair, while I brushed it through. It worked great, and then Littletree decided we should do her hair too. I coloured a few of her dreads, and rubbed some through her fringe, I think the final effect is really cool. Littletree really loves it, she went ouside in the sun so it can dry, and then used up the rest of the bottle of colouring making potions in different containers. I'm curious how long it will last and maybe I'll buy the full range of colours next time and we can do rainbow hair! So now she has spent half of her waking hours in the last day on this website (which I have to sheepishly admit is pretty cool). There's this role-playing game called BarbieWorld, where you get your own avatar, that you can dress and style how you like, change the hair and face and colouring etc. and you get your own room that you can decorate and furnish how you like. Then there's a kind of map of the local mall, that you can walk around in, go into shops and buy stuff (you make money in various 'jobs' like doing nails in a salon, mixing music videos or giving Ken a makeover). There's all these other kids playing, and you can chat with them, give gifts, invite each other to your rooms, have parties, and stuff. you also get a cell phone so you can text your friends when they are online. Littletree made friends with one girl whose user name is LUV2BeMe, I thought that was pretty cool. They chatted for ages and gave each other gifts. Obviously, at 4, Littletree, despite all her awesome literacy and typing skills is still not really up for IM conversations, so I did the reading and typing while she ran the mouse and told me what to say. But I was amazed at how many words she actually recognised. several times she said aloud the reply before I could read it to her. And she's really starting to get the hang of saving money and working for money to buy the things she wants. Like there was a skirt she really wanted to buy, but she didnt have enough for it, so she went to the nail salon, and worked out how many manicures she needed to do! Okay, I'll admit it, this Barbie thing is actually cool. I started thinking maybe I could start buying up cheap old barbies, like on eBay and in the opshop, and making them clothes and hairstyles to look like Rainbow people. Like we could have the Dreadlocked Feral Barbie, and the IndiaHead Barbie, and the Forest Pixie Barbie, and the YogaSpace Barbie, and the ChaiShop Barbie... she could come with accessories like the Barbie Tipi and the Barbie Sweatlodge, and her own cup, bowl and spoon, and her own talking stick! We were invited to visit some new friends, but little did I know they weren't the innocent family they appeared. Littletree quickly got over her customary shyness when she saw the massive trampoline they have in the back yard, and soon the girls were jumping around, to the delight of their baby boy of the obscenely cute Dimples. Slowly, I got to know A+A, and though we were both trying to hide it, they are Radical Unschoolers too! As the stories of our parenting histories unfolded, I realised that our paths have been so similar they must have been stalking me for some time. The girls got out some little bottles of food colouring and started making 'experiments', mixing the colours in different containers, and having a great time of it. I felt great, like, yeah! this is what unschooling is all about. This is the kind of stuff all those unschooling mamas on the message boards talk about. Of course, we talked about how it was an issue for them to let M have Barbies, and I agreed. but thus far, Littletree has never asked for one, nor expressed a real interest in having one, so its been a non-issue. Littletree found that M has Barbies that are characters from the Barbie Fairytopia DVDs she has. Of course, she decided that she wants one. Oh, it was tough for me. and the darn thing cost $20, but I stopped at Woolies on the way home and bought Littletree a Barbie. The same one, that is 'Elina' in Barbie, Fairytopia; Magic of the Rainbow. Well, I did it. I let go of my own judgemental, conditioned "boycott Barbie" Politically Correct response, and respected Littletree's desire to have her very own Barbie. and to be honest, I could have easily delayed her, saying that we'd get one the next time we came to town, or 'failed' to find it in the shop, or convinced her that the $5 Barbie was better than the $20 one that she wanted. But Ithink secretly, there's a little girl inside there who wants that Barbie too! "There is a picture of milk pouring into a glass on the side of the milk carton!!!!" um... Wow! what is the world coming to...?! Other amusing exclamations include a remark about Sunshine, our yellow van. Littletree announced that she'd rather we have a Red car. Then we could call it "SUNBURN"
The last couple of days were just me and Littletree staying at home and enjoying life. We planted some seedlings in the garden, played a lot outside, fed the cows, read stories, drew pictures... Ninny from next door came over to play quite a bit too; the girls have decided they are Sleeping Beauty and Cinderella, and they spend much of the day up the avocado tree behind the house. I managed to connect with some other Unschooling families in the area, we hope to get a visit in next week. I'd so love to connect with other families, and get more involved in the community. We found this cool branch that dropped off one of the palm trees; it looks like a mini-tree, attached to a perfect headband shape. So I did the obvious - it looked great, but was a bit too heavy and unwieldly for general wear. But still, I think it suits me. Anyway, the market was fun, we ran into a few friends, browsed hippie stalls and mostly just hung out. Towards the end we drifted to the drumming at the Rainbow Chai Tent. I played Chasey with Littletree amongst the chai drinkers while Purple went off in search of food. As the crowd grew and the drumming kicked off, we retreated to the edge of the crowd to survey the scene. While I stood chatting with old friends, Littletree started a very elaborate series of little trenches in the gravel, and built little twig bridges over them. She was experimenting with many different ways of setting up her various bridges, and of course, very upset when about once every minute someone walked through it all :( I ended up spending much of the afternoon playing security guard to her village of bridges, and the only way we managed to get her to leave was with the promise of constructing bigger bridges at home. So I've gotta start reading up about architecture and engineering! We went to a Live Earth party last night at Evey Knevey's place, it was Fancy Dress, with an "Earth" theme. I went as myself (a green majik faerie); I wore my nicest clothes and put a crown of vines and leaves on my head. Littletree went as herself (a pink faerie princess); she wore her pink 'spinning' dress and fairy wings. Purple actually got dressed up, sort of. He fashioned elves' ears out of paper and stuck them on with sticky tape, wore a brightly-coloured felted vest that we found in the house when we moved in, and my green felt hat. Stupidly, we didnt take any photos. On the drive down, I almost ran over a Koala, sitting in the middle of the road. It sat in the headlights and looked at us, and slowly ambled to the other side of the road, looked at us some more, before disappearing into the bush. It took more than the given 3 minutes to scrabble for my purse, get out the camera, and take a photo. Actually, I did manage a great shot, but forogt that the flash was set to OFF, so it didnt work, and by the time I got it all set right... too late. Well, serves me right for trying to photograph a magical moment, rather than just feeling the beauty. Well in the end, we worked it out. Turn off on the road towards the hospital, Check. At the bottom of the hill turn Right, Check. Drive almost until the end, and you'll see a house with lots of lights and lots of cars and combis parked. Check! We parked, adjusted our costumes and went in. The party was nice, but we didnt know anyone there, and we were the only ones dressed up. Of course. Everyone was very nice, and commented on how cute Littletree was. We couldn't see Evey anywhere... and slowly it dawned on us... NOT THE RIGHT PARTY!!! We went outside to call her again, we had indeed followed all the directions correctly. Just that her place was a minute further up the road! Sheepishly we left the first place and arrived to the real party. We watched Al Gore's speech on their massive Home Theatre, and mingled with other people. Purple won the prize for best costume - a tray of organic seedlings. We have a big box of Plasters, really good Elastoplast, the fabric kind with really good stickyness, that I bought in Thailand when they were really cheap. But they are the kind that disappear whenever you need them. Its funny, I've had them in my backpack all this time, and I always just knew they're there any time I need them. And quite a few times in the un-packing and re-packing of our travels I've seen them. But for some reason, everytime we actually need a plaster, they aren't there. A bit like Macavity the Mystery Cat. A few times, we stopped in the supermarket, wondering if we should buy plasters, and every time I say, 'no, we have that whole huge box somewhere'. When we moved into this house, we found them, put them somewhere useful, never to be seen again. Well, I shouldn't say never, because Purple said he's seen them twice since then, both times in a different, random, obscure place. So, Purple is trying to fix our front door, which is really a kind of a joke door, as it doesnt close properly, and the gaps around it let in so much cold wind I just gave up on it and blocked the whole thing off with a big heavy blanket. It means we cant use the door, but we have 2 others and it made a huge difference to the warmth of the house. Anyway, he decided to put a doorstep in that blocks off the gap at the bottom, repair the hinges a bit and is now trying to put in a board to cover the gap at the top. Only he cut his finger, not badly, but enough... and we cant find the plasters! (of course). I'm searching everywhere (and hey, its not a big cottage, basically just one room) but they're no where to be found. Purple said he saw the packet just a couple of days ago, but cant remember where. I suspect the Butler is guilty... his alibi is paper-thin, and he's always been jealous of them. This morning, Littletree found a kind of Aloe in our garden and she was so excited, and came running to show me the "Aloe Vera - just like in Tel Aviv!" On closer inspection, we decided its not Aloe Vera, but another kind, and we got online to search for it. Littletree was so interested in all the different kinds of Aloe, until the google search got us to a page of a hosiery company that has a line of stockings made with Aloe Vera "for silky legs", and she was even more interested in the pics of mostly-naked women in stockings. I just love these old psychedelic clips! So, we are trying to answer the age-old question: if you serve beer in a kiddy-cup, is it still bad for kids? Meanwhile, we just found out that the property our wonderful new home is on got sold (well, they're still working out the paperwork). Seems the new owner is happy for us to stay, but Joybelle will have to move, bursting our bubble of making an Unschooling group. Next door has some new chicks, and Littletree spent some time playing with them. She wanted to know why they have to be in a cage, which led to lots of discussions about predators, and what kinds of predators are in our area, and which ones eat chicks. Anyway, there will be a scout meeting tonight for the rainbow gathering, probably a few people will come around, hopefully something useful will come of it. We drove down to Nymboida to visit Laena for the weekend, Friday we cruised to Lismore so Purple could take his driver's test (which he failed :( so now he cant drive), and to meet the local homeschooling group. In Lismore I came across these two places: the ROUS Hotel and ROUS Water. I just wonder if these businesses are created for Rodents of Unusual Size, or merely named after them? So, on to Laena's we arrived, a little later than I'd planned, but still in time for dinner. It was so wonderful to see her again, and coming back to her house was really like coming home. We had a lot of chatting and catching up. Littletree was sweet and made a good impression. In the morning we went down the hill to have breakfast with Laena's eldest daughter Kaya (all grown up) and her husband. they have 2 kids, a girl, 3 and a boy, 1, and they live with a woman who also has a son, 4. They are all focused on Unschooling and natural home birthing and everything I'm passionate about, so it was really great to meet them. They really want to start getting more comunity around, so we're considering moving up there after the winter. Laena's house is absolutely glorious, she and her ex-husband built it all by themselves, by hand. its made of Mud-Brick, with a rammed earth floor and stunning rockwork. Our tipi had arrived there after being in Quarantine for weeks, so we have that back now, and Purple scavanged a bunch of stuff from one of the sheds. I spent some time working with Laena in her garden, which is looking wonderful and felt great to dig in. I can really see us living in our tipi with a little shack somewhere on this land.